I would stick to work with barbells and dumbbells, then implement in a one or two ‘machine’ movements such as a fly or hammer strength press. ✓ This way you are able to build up more of your stabiliser muscles – which are used when you lift free weights – but not when using a machine. Furthermore, you can hit your chest from different angles with free weights; however, machines are stuck in one arc, and one motion. ✓ One good use for machines is as a finisher, since you can easily do drop sets, or neurological overload sets, to completely fatigue your chest and totally finish it off. It’s easy to drop the weight and complete another set without faffing around taking weight off, or adding weight onto a bar. The dreaded F-word. Form is important when it comes to any exercises or muscles group. Given how popular chest day is, many people forget to leave their ego at the door when they enter the gym and decide to try and lift as much weight as they possibly can. 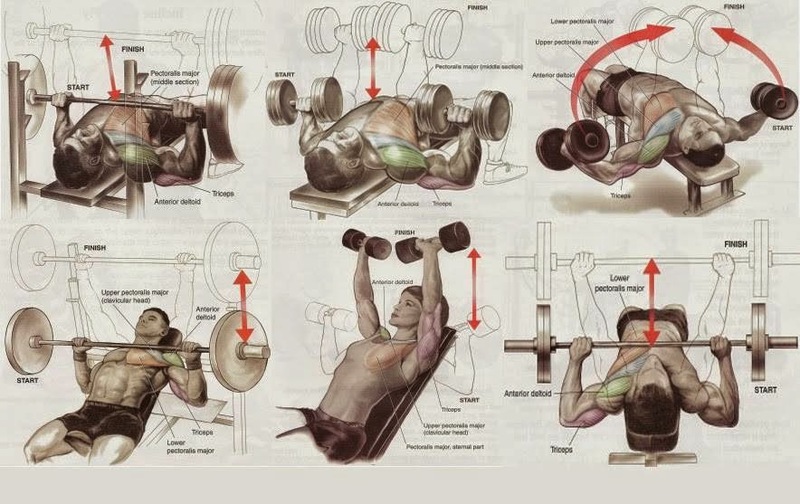 On bench press for example, you should use a weight that you are comfortable with for your working sets, gradually increasing the weight for progressive overload. If you are only performing half reps or need a spotter to help you with most of them, then you should lighten the weight. ✓ Read up on how to perform each exercise properly – for example: bench press form – and get someone to critique your form. You will thank yourself for it later. ✓ Jay Cutler once said ‘Work your muscles, not the weight’. This is very true, especially when it comes to training chest. You should concentrate on contracting your muscles rather than just moving the weight.